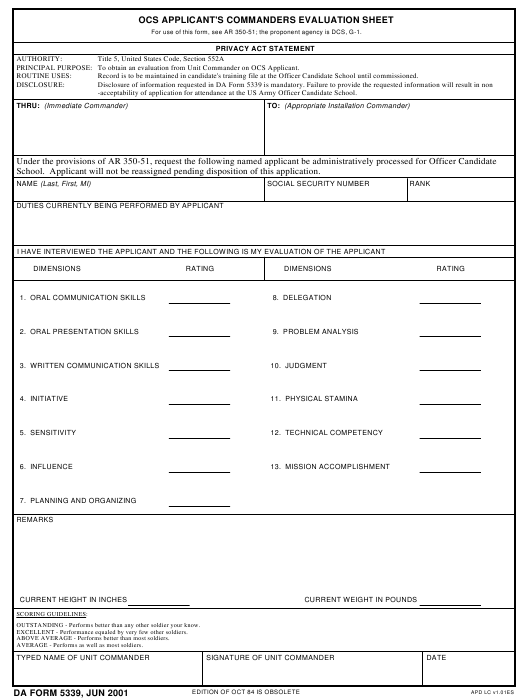 DA Form 5339 - also known as the "Ocs Applicant's Commanders Evaluation Sheet" - is a Military form issued and used by the United States Department of the Army. The form - often mistakenly referred to as the DD form 5339 - was last revised on June 1, 2001. Download an up-to-date fillable PDF version of the DA 5339 below or request a copy through the chain of command. For use of this form, see AR 350-51; the proponent agency is DCS, G-1. To obtain an evaluation from Unit Commander on OCS Applicant. Record is to be maintained in candidate's training file at the Officer Candidate School until commissioned. -acceptability of application for attendance at the US Army Officer Candidate School. School. Applicant will not be reassigned pending disposition of this application. OUTSTANDING - Performs better than any other soldier your know. EXCELLENT - Performance equaled by very few other soldiers. ABOVE AVERAGE - Performs better than most soldiers. AVERAGE - Performs as well as most soldiers.